Founded in 2009 as a joint venture between Zelenograd innovation technology center and group of expert in medical electronics from Moscow Institute of Electronic Technology (Technical University), Zelenograd innovation technology center of medical equipment (ZITC-MT) is focused in the area of development and commercialization of innovative Russian medical equipment. ZITC-MT aspires to create high technology production of medical equipment to keep lives and health of millions people around the globe. Having broad experience with development, certification, production and support of the equipment, ZITC-MT staff is backed up by scientific and experimental researches made by leading russian scientists in medical field. The work has started from building-up ISO 13485 controlled environment to be ready to supply company products worldwide: DIN EN ISO 13485 : 2010 Certificate ( 350 Kbyte). Research and developmental of medical devices if fields of defibrillation, hemodialysis and artificial human organs. Commercialization of the results of R&D activity by licence of technology and production of devices. 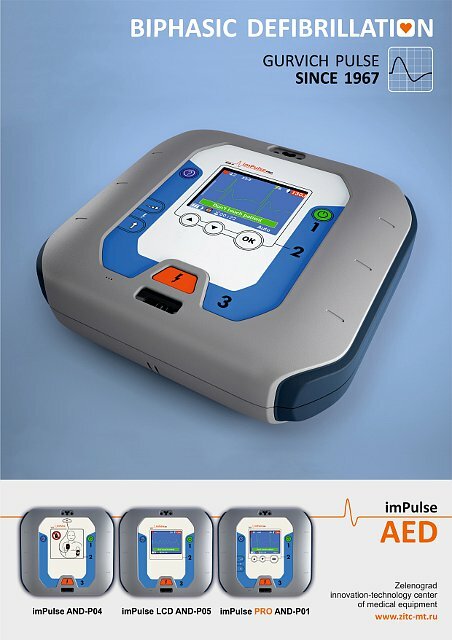 imPulse AND-P04, imPulse LCD AND-P05 and imPulse PRO AND-P01 AED ( 3,857 Kbyte) for clinic and public application. These defibrillators generates quasi-sinusoidal biphasic Gurvich pulse: Why quasi-sinusoidal biphasic Gurvich pulse? ( 667 Kbyte).